The KROHNE Summit 8800 Digital Flow Computer features a touch screen graphic display and dramatic performance, handling, and interoperability improvements over standard flow computers. An extensive feature set supports the latest developments in metering, data handling, and system maintenance at an extremely competitive price. The Summit 8800 is ideal for a wide variety of custody and process applications, including metering oil, gas, wet gas, steam and water; bulk chemicals batching; heat exchanger metering and logging; and metering production processes in the pharmaceutical industry. Unsurpassed network support allows users to minimize service costs and implement automatic remote metering. Automatic performance monitoring increases accuracy and reduces recalibrations. KROHNE has included numerous improvements in the Summit 8800. For example, the unit contains a dedicated microprocessor with a fast 1/4-second processing cycle for each input/output (I/O) board rather than using one shared processor. Internal operations are based on time-tested Application Builder software. A removable multi-gigabyte memory card stores data with enough capacity for several years of flow information. The user-friendly scroll-and-click navigation and touch-screen control makes operation simple and straightforward. The large, easy to read color display, with multicolor traffic-light guidance also simplifies operations and system maintenance. Network security is enhanced with multiple, redundant Ethernet ports while wide-area communication is possible using a range of common protocols. The Summit 8800 is extremely versatile due to its modular design, which allows the user to plug in up to eight I/O or communication boards as needed for multiple flow streams, analyzers or additional network communications options. The unit has several innovative security features, including configurable multi-level access and authorization and an optional personalized electronic proximity key. 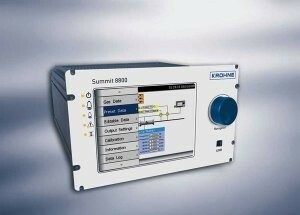 In addition, for the first time ever in a flow computer, KROHNE’s Summit 8800 separates fiscal and maintenance data, thereby permitting remote maintenance without compromising security and data integrity. The 880’s security system provides a full audit trail with personalized login identification information.